Karl Lagerfeld and a model in Chanel’s 2016/17 resort collection. 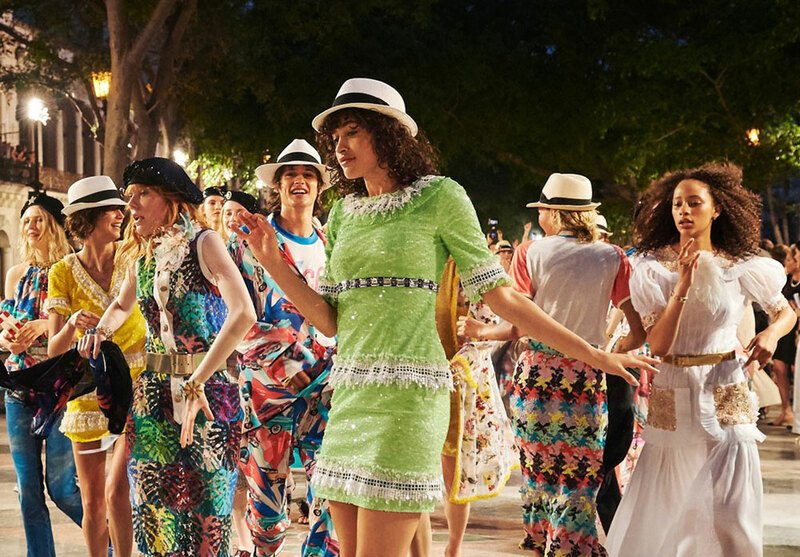 Although Lagerfeld had never been to Cuba before, the resort collection was inspired by the tropical country. Bouclé separates were presented in bright turquoise and pinks, fedoras were a major accessory, suits were casual cool, and layered ruffles helped models cha-cha down the runway. To get to the show, the fashion elite, including Gisele, Tilda Swinton, and about 700 celebs, models, and editors, were shuttled to the island via cruise ship. Right before showtime, a fleet of colorful classic cars transported attendees to Paseo del Prado where Stella Tenant opened the show followed by models such as Lindsay Wixon and Binx Walton. Another noteworthy model was Antonio Castro, grandson of Fidel. The 17-year-old commented, “It is an honor for all Cubans for this big event to take place here.” Along with Castro, three other Cuban models walked the show. They were chosen after a a long process involving try-outs and training at a modeling academy. There were some who did not echo Castro and Lagerfeld’s excitement, noting that the show was closed to the public despite being shown at El Prado, a public park, and that most Cubans could never afford Chanel as many citizens live off of only $20 a month. In fact, the brand is not available for purchase in Cuba. Many also felt that the collection was based on one-dimensional stereotypes, one model even smoked a cigar as he walked down the runway.